It is a good thing that the August Break Challenge does not have rules to follow, because if it did, I would be breaking every one with this post. The two pictures posted today were not taken by me, nor were they taken in this century. These are pictures of me when I was ten years old. Now why would I be posting pictures that are over 40 years old during a challenge that is supposed to help me focus on living in the present? Well, let me explain. I started the day by enjoying my typical morning routine of leisurely reading the blogs. While I have not yet read The Happiness Project by Gretchen Rubin, I have been following her blog off and on for the past several months. Today’s post was a vlog entry in which she focused on the topic of fun: how we all need to add fun to our lives; it is necessary – even vital – to the pursuit of happiness. She also pointed out a life-lesson that she has learned along the way: someone else’s idea of fun may NOT be fun for me. It is important to discover what fun means to each of us individually – and then be sure to include time in our schedules to enjoy those activities. But what if I don’t know what is “fun” for me? What if I have lost sight of that important ingredient in life – focusing all my time and energy on serious responsibilities and duties and constantly putting the “frivolous” projects on hold? Well, Gretchen advises reflecting back on my childhood. What did I enjoy doing when I was 10 or 11 years old? What I enjoyed doing as a child are likely the same things that would bring me joy today. But even with that great suggestion, I could not really remember what fun I had at that age (I have often thought that I ceased being a child when I was eight). 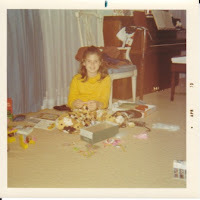 In looking at this photograph of Christmas morning 1969, it appears as though I enjoyed playing Barbies. Not so…I thought that was what ten-year-old girls were supposed to like doing, so I tried very hard to fit in. She also suggested looking at how I currently fill my free time (yes, we all have free time, we may just choose to deceive ourselves). Truth be told, I spend most of my free time surfing the internet: blogs to discover new books to read; teacher sites to discover new ways to bring literature to life; youtube to watch photography tutorials. I always remember liking school (I guess I really am a true nerd) and when I was not in school, I liked playing school: lining up all my stuffed animals and teaching them math lessons on the chalk board. I never enjoyed the pressure of taking tests, but I always loved the educational process (research papers were my absolute favorite assignment — again, I did not like worrying about the grade, but I loved digging deep into a subject and writing my results). And how do I use the internet? To educate myself! This picture shows me on Christmas evening – after all the packages have been opened and the festivities have died down. What did I choose to do for fun? READ. (and if you look closely at the previous photo you will see about 3 or 4 books that Santa gave me that year). So, I am really not quite sure that I have resolved this issue of finding fun in my life – but I am well on my way. And what a wonderful blessing to discover that my vocation is what truly brings me happiness. Thank you Gretchen, for helping me to focus on me today. For those of you who might be interested in her recent video —- ENJOY!! Oh, Molly, I was the same student and still am. I have fun and enjoy the search for information and actually often do research before posting a blog or writing a short piece or, horrors, even a letter. Give me a book and you are a friend for life. When I was ten, my nose was usually stuck in a book or an encyclopedia was open as I eagerly sought out information (any information – now I use the internet). I, too, played school, though my sister and friends quickly adjourned for recess. No problem. Lesson plans filled my time. What made me happy still makes me happy; reading and gardening, cooking and family and friends. Discovering something new or finding something old. What I finally discovered was that I didn't need to do what was popular or other folks wanted me to do. I needed to do what I wanted to do. Thank you for your provocative post. Molly, I love this post. It was great seeing the pictures of you at 10. I also related to what you said about ceasing being a child at 8. Me too, I think. At 10, I loved reading, naturally. I loved the library and just being among books. I found it fun to browse and browse and browse. Is that what I still do while hopping round and round the web, from Amazon to blogs to Book Depository to more blogs to the library website? Sorta. I was not a crafty kid or an athletic kid. I used to think that I liked cooking, but you know, I really don't. I had to help my Mom with it and she was not a good cook, so I learned adequately, but was not creative with it. I loved making lists and charts and keeping track of things. Kind of like spreadsheets or accounting records. Geez, and my degree is in accounting, which I found boring, but not all parts of it. Love making lists of books. Well, lots to think about. Thanks again for the post and giving me a nudge to ponder these things. What a great post and exercise to help us all to consider what really makes us happy. I'm going to dig up some photos from that time and see what I find out! But I know for sure I'd be reading in a good many of them! I haven't yet read THE HAPPINESS PROJECT either, but the concept is wonderful! And you really put it into practice today; I love that you took the time to look back at your childhood and discover (or rediscover) these similarities between you and 10-yr-old Molly! Thanks for sharing your story and the photos. I have this book but plan to start it later this year. It sounds like a wonderful thing to work on. And it sounds to me like you made your fun your career!! Not many people do that so hats off to you!! I have this book on my Kindle (bought it January 1st – boo for me!) and I keep saying that I really need to get to it. Maybe I am waiting for when I need it the most! I think when I was ten, it was all about Barbie's and reading, so we could have been BFF's back then. yep, I loved reading then and I love reading now. Wasn't this a great video? I love Gretchen Rubin! I was remembering the other day how much I loved to play librarian – still do:) Thanks for sharing this here! Books, movies, and music! Always fun for me. Love seeing the pictures of you! When I take a trip down memory lane, what I enjoyed doing was writing and reading. I remember writing my first story (Candyland, starring Mint) when I was six or seven. Illustrated it, too 🙂 So I don't think I've changed much – your post has made me see, though, that until recently I definitely was not giving my version of fun a priority position in my life! Wonderful pictures of you! 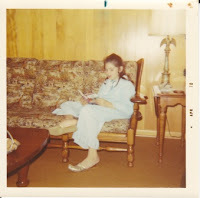 I think when I was that age (or any age), after the excitement wore down, I snuck up to my room and read, too. Always my favorite way to spend time. A year or so ago someone asked me this very same question…"What do you do for fun?" I couldn't answer it either. My personal life had become so intertwined with my professional life that the two had become one. That wasn't such a good thing for me because my professional life was leaning away from the aspects of my job that I love, books, reading, writing, teaching and working with students to administrative duties and political squabbles and reports. I made a concerted decision to finish up those projects I was currently working on, turn down any more offers that took me away from my literary loves and my students, and focus more on my own family. My husband and I now have an unspoken rule at home; we leave work at home (difficult when you both work at the same institution), but it has helped us focus more on the things we love and strengthened our family in the process.